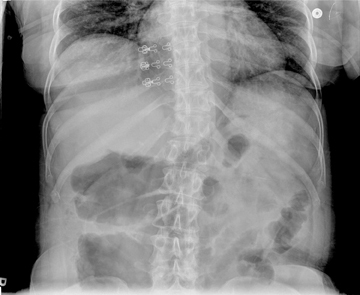 A supine abdominal radiograph with distended bowel loops in the right flank and epigastric region. 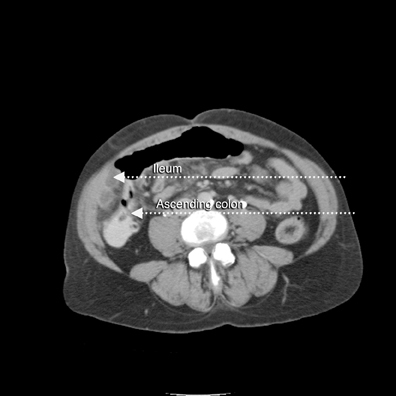 Lateral CT/scout shows distended large bowel with fluid levels (note haustra) (Figure 2). Scanogram shows distended bowel with haustra oriented vertically at the epigastrium, and measuring > 9 cm in diameter. Note stomach with feeding tube in left upper quadrant (LUQ). Scanogram shows distended bowel with haustra oriented vertically at the epigastrium, and measuring > 9 cm in diameter (Figure 3). 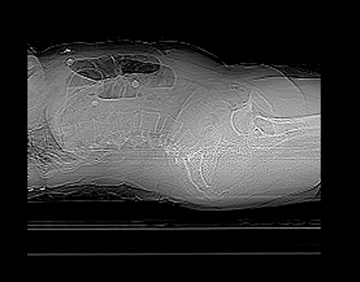 Note stomach with feeding tube in LUQ. 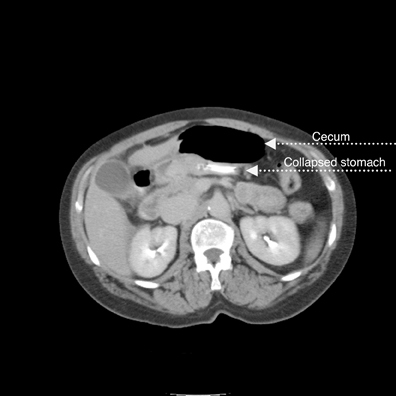 CT image with IV contrast shows gaseous distended cecum anterior to collapsed stomach containing a feeding tube (residual oral contrast after multiple emesis) (Figure 4). 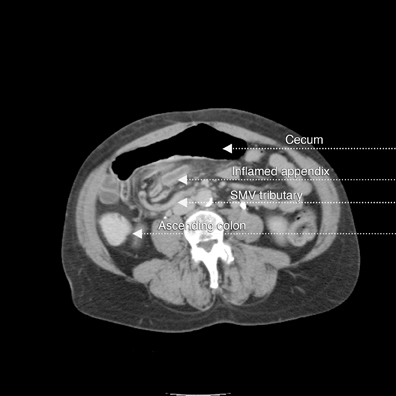 A 1-cm diameter appendix interposed between the malpositioned, distended cecum anteriorly and the displaced terminal ileum posteriorly (Figure 5). The curvilinear course of superior mesenteric vein (SMV) tributary veins is also noted. This image captures the ascending colon coursing anteriorly to meet the air-filled cecum (Figure 6). However, the classic bowel tapering (“beak”) at the point of twist is not well seen. Note the characteristic, malpositioned, and fluid-filled ileum to the right of the ascending colon. 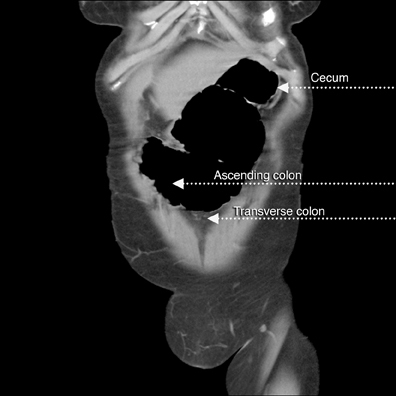 A CT coronal reconstruction image (Figure 7) shows malpositioned, distended proximal ascending colon and cecum anteriorly. 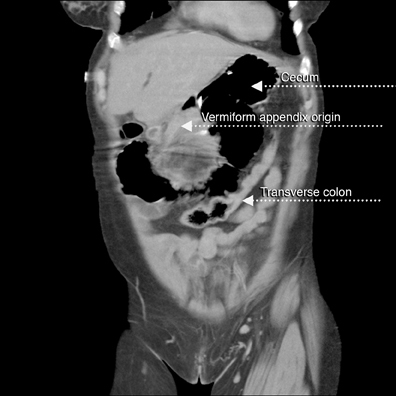 A more posterior CT coronal reconstruction image (Figure 8) shows the distended cecum superiorly as well as the collapsed transverse colon inferiorly. 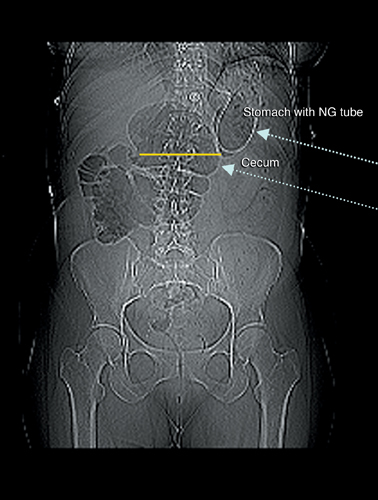 The further posterior CT coronal reconstruction image (Figure 9) shows the nasogastric (NG) tube in the collapsed stomach. Moreover, a 11-mm diameter appendix is seen curling toward the midline in the right upper quadrant (RUQ). The average age of patients at presentation with cecal volvulus is 53 years.4 Symptoms include colicky pain of sudden onset, vomiting, borborygmus, and often dehydration with electrolyte disturbance. Leukocytosis may also be present. Early diagnosis is essential to reduce the reported high mortality rate. Volvulus is essentially a closed-loop obstruction that may lead to vascular compromise with gangrene and perforation. Cecal volvulus occurs in patients with a mobile, defectively fixed right colon, often while they are asleep. The volvulus occurs in the ascending colon, above the ileocecal valve, and takes one of 2 forms. Axial torsion, the more common form, is a twist of 180-360 degrees along the longitudinal axis of the ascending colon. This form has a high mortality rate, with immediate vascular occlusion occurring along with the obstructive process. The second type (making up as much as 30% of cases), illustrated by this case, is the bascule type, where the cecum folds anteriorly and cephalad to the ascending colon, with the production of a flap-valve occlusion at the site of flexion. In this case, colonic atony due to appendicitis with traction of the diseased appendix seemed probable. At surgery there was a non-ischemic, mobile ascending colon with the cecum twisted around it in the epigastrium. The appendix was inflamed. In diagnosis, bowel gas patterns may not be characteristic as the right colon/cecum may be displaced to any part of the abdominal cavity.The distended cecal loop may be confused with a sigmoid volvulus or even a distended stomach. In fact, in one large review with abdominal radiographs alone, cecal volvulus was suggested in 46% of patients, but diagnostic in only 17%.4 If the positive diagnosis is not made on the abdominal series, follow-up films, contrast enema, or CT exam is required. In most patients, obstruction is almost complete; thus, the distal colon is usually empty and the small bowel is frequently distended.Occasionally, the folded, bascule-type volvulus may be associated with signs of incomplete obstruction. The ileocecal valve may be identified, and occasionally the point of torsion may be outlined by intraluminal gas as an area of cone-like narrowing, or the so-called “beak” sign. In the cecal bascule form of volvulus, the distended, air-filled cecum is located more centrally. The ileum may passively twist with the cecum such that the small bowel is not obstructed. If the appendix is gas filled and attached to a distended cecum in an unusual location, the diagnosis can be made readily. 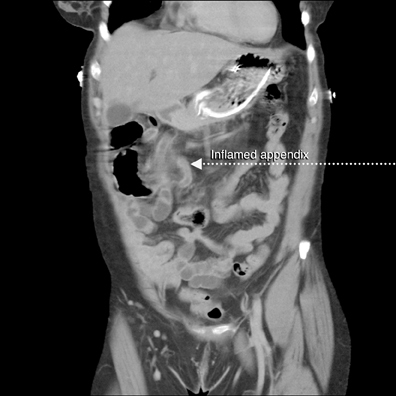 In our case, care was taken not to mistake the CT appearance of the inflamed appendix for a displaced ileal loop. On CT, the axial twist volvulus demonstrates a U-shaped, distended bowel segment and signs of ischemia (antimesenteric border),including mural thickening, infiltration of the mesenteric fat, and pneumatosis intestinalis. A whirl sign may be apparent with a tight torsiono of the mesentery caused by the twist between the afferent and efferent loops. Single-contrast barium enema (BE) examination is used for the evaluation of cecal volvulus. As little barium as possible should be allowed to flow proximal to the site of obstruction as flooding proximal to the obstruction site might precipitate complete obstruction. An attempt should be made to reduce the volvulus. Reduction may be achieved during colonic filling by barium, yet reduction occasionally occurs during barium evacuation. In the presence of a double obstruction of the colon (left colon obstruction associated with a cecal volvulus), evaluation of the right colon may not be possible with BE, and the diagnosis may need to be made by plain radiographic findings or CT.
Volvulus is not a rare condition. The various imaging appearances must be recognized and considered immediately on plain film exams. High morbidity can be reduced by early treatment. CT scans and barium enema examinations are useful in diagnosis. Cecal resection is suggested surgically. Khan AN, MacDonald S, Al-Khattab Y, et al. Cecal volvulus. Medscape. http://emedicine.medscape.com/article/364967-overview. Last Updated: May 25, 2011. Accessed July 21, 2011. Henisz AK, Silverman PM, Miller D; Reyelt P. Cecal volvulus. Applied Radiology. 2000;29: No. 11. D’Egidio A, Lipschitz J. Acute appendicitis associated with caecal volvulus. A report of 2 cases. S Afr J Surg. 1988;26:27-28. Bonis PAL, Hodin RA. Cecal volvulus. http://www.tuftsmedicalcenter.org/ForHealthCareProfessionals/GraduateMedicalEducation/InternalMedicineResidency/DeptofMedicine/default/2007DOMAnnualReport10-02-07BibOnly.pdf.Updated: March 5, 2009. Accessed July 21, 2011. Gore RM, Levine MS. Textbook of gastrointestinal radiology, 2nd ed. Philadelphia, Pa: WB Saunders Co; 2000:704-725. Cecal bascule with concurrent acute appendicitis. Appl Radiol.